When Chrissy and I first started in this business back in 2008, we could see the big picture very easily. We wanted to be in the $50k club. And that was, to get qualified as soon as humanly and financially possible. It wasn’t rocket science that to be paid at the higher level, we must position ourselves at the higher level. Exactly the same as if you had a job somewhere and were after more dollars. It’s been an exciting time! of growth and expansion within our business over the past number of months. Since March of this year we have seen Eight Distributorships join the prestigious ranks of the 50k Club. And six of them achieved this milestone in the past 6 weeks alone! To reach this level, each business owner achieved in excess of $50,000 USD in a single month! Woaza! It’s a company record to have so many new members in such a short period to time. There’s really never been a better time to take control of your financial future with this company. p.s. We feel we are at the cusp of a huge expansion. All the ducks seemed to be lining up well, and that’s not by accident. Online Businesses are the future. People are searching for legitimate options. This is the exact reason why we decided 9 years ago to go towards this type of business, compared to the old fashioned inefficient but totally necessary traditional bricks and mortar type of business. The thought of buying, for example, a mobile coffee franchise at $130,000 and having to sell 200+ coffees per day just to break even, did not appeal to me at all. I would have to make 600 coffees per day to make a 2% return. Why oh why would I want to buy a very expensive job. I would have to go out there, every day, no matter how I felt, or what the weather was like, or I would be going backwards. Then there is the running costs, the maintenance, the cleaning the hygiene regulations… bla bla bla… bla! Business is all about ROI (return on investment) and not working your guts out for the sake of working. There are new options out there if you are willing to look. New options and new types of businesses. The real world is hugely different for everyone. Its the business model that is everything and who gets paid for what. Doing real world math is part of your due diligence. There are new ways to learn and be assisted. Google is relatively new. Before this we had books, encyclopedias. Wow how old school, buts it all there was. The world has changed and we have changed, and we should not have metathesiophobia. (the fear of change) We should be smarter than an irrational fear. Without change there is no progress. Think about how much has changed in the last 10 years, 15 or even 20 years. It is supply and demand. People want better. people want to move away from the industrial age. People are getting older, me I’m getting younger. People will always be entrepreneurial as they were in the 2000 years before the industrial age started. Now there are just so many more option out there because of the demand for a better lifestyle. We care moving forward in learning how to make money work for us instead of us working for money. Look at our podcast and make your own mind up then get back to us and hop on the bus. The Best Ways to Beat Procrastination. Procrastination. A big problem that holds you back. Firstly, a HUGE thankyou to the legendary Jim Rohn taken away from us way too soon. Perseverance is about as important to achievement as gasoline is to driving a car. Sure, there will be times when you feel like you’re spinning your wheels, but you’ll always get out of the rut with genuine perseverance. Without it, you won’t even be able to start your engine. Procrastination will stop you from picking up you keys. Do you see what’s going on here? A fault is being turned into a virtue. The perfectionist is saying their standards are just too high for this world. This fault-into-virtue syndrome is a common defense when people are called upon to discuss their weaknesses, but in the end it’s just a very pious kind of excuse-making. It certainly doesn’t have anything to do with what’s really behind procrastination. Remember, the basis of procrastination could be fear of failure. That’s what perfectionism really is, once you take a hard look at it. What’s the difference between being afraid of being less-than-perfect or afraid of anything else? You’re still paralyzed by fear. What’s the difference between never starting or never finishing? You’re still stuck. You’re still going nowhere. You’re still overwhelmed by whatever task is before you. You’re still allowing yourself to be dominated by a negative vision of the future in which you see yourself being criticized, laughed at or punished. This negative vision of the future is really a mechanism that allows you to do nothing. It’s a very convenient mental tool. I’m going to tell you how to beat procrastination. I’m going to show you how to turn procrastination into perseverance, and if you do what I suggest, the process will be virtually painless. It involves using two very powerful principles that foster productivity and perseverance instead of passivity and procrastination. No matter what you’re trying to accomplish, whether it’s writing a book, climbing a mountain or painting a house, the key to achievement is your ability to break down the task into manageable pieces and knock them off one at one time. Focus on accomplishing what’s right in front of you at this moment. Ignore what’s off in the distance someplace. Substitute real-time positive thinking for negative future visualization. Suppose I ask you if you could write a 400-page novel. Sounds impossible, right? But suppose I ask you a different question. Suppose I ask if you can write a page and a quarter a day for one year. Do you think you could do it? Now the task is starting to seem more manageable. We’re breaking down the 400-page book into bite-size pieces. Even so, I suspect many people would still find the prospect intimidating. Do you know why? Writing a page and a quarter may not seem so bad, but you’re being asked to look ahead one whole year. When people start to look that far ahead, many of them automatically go into a negative mode. So let me formulate the idea of writing a book in yet another way. Let me break it down even more. Suppose I ask you if you can fill up a page and a quarter with words—not for a year, not for a month, not even for a week, but just today? Don’t look any further ahead than that. I believe most people would confidently declare that they could accomplish that. These are the same people who feel totally incapable of writing a whole book. If I said the same thing to those people tomorrow—if I told them, I don’t want you to look back, and I don’t want you to look ahead, I just want you to fill up a page and a quarter this very day—do you think they could do it? One day at a time. We’ve all heard that phrase. That’s what we’re doing here. We’re breaking down the time required for a major task into one-day segments, and we’re breaking down the work involved in writing a 400-page book into page-and-a-quarter increments. Keep this up for one year, and you’ll write the book. Discipline yourself to look neither forward nor backward and you can accomplish things you never thought you could possibly do. And it all begins with those three words: Break it down. We know how important writing is to goal-setting. The writing you’ll do for beating procrastination is very similar. Instead of focusing on the future, you’re going to be writing about the present just as you experience it every day. Instead of describing the things you want to do or the places you want to go, you’re going to describe what you actually do with your time, and you’re going to keep a written record of the places you actually go. In other words, you’re going to keep a diary of your activities. And you’re going to be amazed by the distractions, detours and downright wastes of time you engage in during the course of a day. All of these get in the way of achieving your goals. For many people, it’s almost like they planned it that way, and maybe at some unconscious level they did. The great thing about keeping a time diary is that it brings all this out in the open. It forces you to see what you’re actually doing—and what you’re not doing. Your time diary doesn’t have to be anything elaborate. Just buy a little spiral notebook that you can easily carry in your pocket. When you go to lunch, when you drive across town, when you go to the dry cleaners, when you spend some time shooting the breeze at the copying machine, make a quick note of the time you began the activity and the time it ends. Try to make this notation as soon as possible; if it’s inconvenient to do it immediately, you can do it later. But you should make an entry in your time diary at least once every 30 minutes, and you should keep this up for at least a week. Break it down. Write it down. These two techniques are very straightforward. But don’t let that fool you: These are powerful and effective productivity techniques. This is how you beat procrastination. This is how you get yourself started. Chrissy and Col Greig, Lifestyle Entrepreneurs. Marketing videos, a very good strategic business move, and great fun. Marketing videos a very good strategic business move. 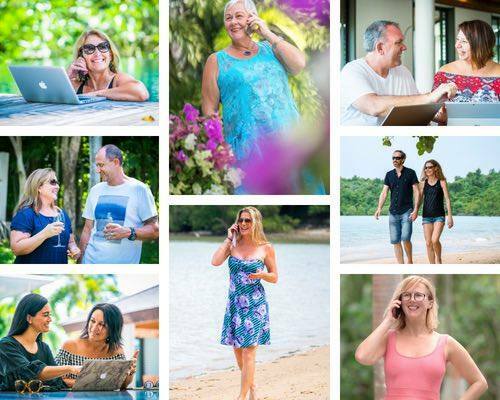 Recently we went to Thailand to visit Rachel and Shane Krider, very good friends for the last 10 years and owners of a personal development business now worth over $170 mil. We are proudly part of this business and we stayed with them in their resort style home on the beach. Absolutely beautiful… stunning. Enormous gratitude for their hospitality, generosity and friendship. We were invited to stay for about 5 days and while we were there we had the chance to do our new marketing videos. What great fun that was. We had a professional film crew headed by Phil with Charlie and Joe. The company called Helicam used drones and a multitude of cameras and gadgets to take a million photos, videos and audios. The end result is a very professional brilliant marketing tool. But also captured the simplicity and fun part of this business. Video 2 Our positioning piece. Shown after someone has decided to go forward. Video 3 Our thankyou video . After someone has put their information into our website inquiring from an ad. We were pampered and chauffeured and wined and dined and filmed and … did I say pampered… all in the name of getting the right shots… of course. What an experience. One which will stay with Chrissy and myself for a very long time. For the last 9 years or more, the time which we have been involved with Prosperity of Life, we have been to a dozen different countries, been to dozens of seminars and conferences on wealth creation and advanced personal development, attended gala balls, theme parties in million dollar mansions, driven exotic cars and generally had a ball with an expanding group of like minded driven people who focus on success, and not being around people who are constantly whinging and whining about why they haven’t. The circle of people we associate with now are the people going places. This has a direct effect on our future results. Your circle of influence does 100% effect you and your results. So we decided that the “oh poor me” type of person was NOT the type we need to be around. And also they are much more fun to be around. Nobody complains. Nobody whinges and nobody has any excuse as to why they cannot achieve anything. Nothing is impossible. We are the creators of our own existence and experiences, and are fully responsible for our own results. 5 Reasons why you aren’t Rich … yet. I share these very wise words from the Kiyosaki’s because I have the utmost respect . Thank you Kim and Robert. Absolutely Brilliant. Chrissy and Col Greig, Home Business Entrepreneurs. The road to financial freedom is not easy. As soon as you set off on this path, you run into roadblock after roadblock. Many people become disheartened and give up right away. Others plug along for a while, but without results, they soon give up. Only a tenacious few can push forward and become truly rich. Our emotions and behaviors dictate our future more than we care to admit. And sometimes, it’s the things we’re feeling or the attitudes we’re carrying around that are keeping us from moving forward. There are five main reasons why financially literate people may still not develop abundant asset columns that could produce a large cash flow. Most people struggle with many of these factors, whether consciously or unconsciously. Conquering them is not easy, but it is necessary to achieving true wealth. Fear is understandable. Taking risks, making changes, it’s all scary. It’s alright to feel afraid. What’s not alright is letting your fear overwhelm you to the point that you don’t act. That’s when fear goes from being natural to being a roadblock standing in your way of true freedom. This distrust could be of yourself, and manifest in overwhelming self doubt. It could be paranoia about the markets, or questioning a solid deal, and backing out of an investment at the last minute. We all think we know what laziness looks like. Lying on the couch for five hours straight watch Netflix and eating popcorn. If you accuse a hardworking person of being lazy, you’ll get a very angry retort. A lot of people don’t have the discipline to break their bad habits. And worse, many people don’t even realize that their habits are bad in thefirst place. For example, someone who sleeps late on the weekends might think they’re catching up on needed sleep. But that habit is taking away several hours that they could be researching investments or building a side business. Put another way, many arrogant people who read this blog probably thought,“That doesn’t apply to me” to every single thing above. Now for the best part. If you’re suffering from one or more of the above, it means you have a very good chance of being rich. All you have to do is learn to conquer the roadblock holding you back. Of course, that’s not easy. In fact, it’s incredibly difficult, otherwise everyone would be rich. But acknowledging the factors holding you back from increasing your wealth is the first step. With practiced effort, you can overcome these bad habits and emotions and find your way to freedom. How to remove the negative Monkey Chatter from your head. Rohn: How to Stop Listening to the Negative Voice in Your Head, removing the monkey chatter. The negative monkey chatter in your head will drive you nuts and away from being successful. a much better place to be in…..
Part of the solution to quieting the voice of negativity, the monkey chatter, is learning to listen to the still small voice of success, which resides inside each of us. The voice of success is constantly struggling to be heard about the loud promptings of the voice of failure. Our own free agency allows us to follow whichever voice we choose. Every time we allow ourselves to succumb to the voice of the dark side of life, and are persuaded to repeat errors instead of mastering new disciplines, the voice of negativity grows stronger. Conversely, each time we listen to the urgings of the voice of success, and are persuaded to turn off the TV to pick up a book, to open our journals and record our thoughts, or to spend a quiet moment pondering where our current actions might be leading us, the voice success responds to these new disciplines and grows in strength and volume as each day passes. For each new discipline, another step forward. We can never totally eradicate the voice of failure from within us. It will always be there, urging us to think and feel and act in a way that is contrary to our own best interests. But we can effectively silence this destructive influence by developing a sound philosophy and a positive attitude about life and our future. We just need to take the megaphone away and destroy it. We must each make our own conscious decision to reach out for the good life through the refinement of our thoughts and the careful examination of the potential consequences of our accumulated errors. We must not allow ourselves to think that the errors do not matter. They do. We must not allow ourselves to assume that a lack of discipline in one small area of our lives will not make a difference. It will. And we must not allow ourselves to believe that we can have all that we want to have and become all that we wish to be without making any changes in the way we think about life. This is Be, Do, Have. The journey toward the good life begins with a serious commitment to ignoring the monkey chatter and changing any aspect of our current philosophy that has the capacity to come between us and our dreams. The remaining pieces of the puzzle of life can be of little value if we have not first made the firm resolve to do something with this piece of the puzzle. Again, huge thanks goes to the late Jim Rohn. He will live on forever. Go to my other blogs with various other topics and subscribe as to not miss out on my stories and shared stories…. My thanks also go to my very good friends, Rachel and Shane Krider for being instrumental in me travelling this $uccessful yellow brick road. Dream achieved ……what are you willing to do to achieve your dreams and goals. to give you the life you want? Yes you are busy but busy doing what? Read the below article and then contact us here to learn more about our Online Business in the sector of Personal Development. In a 2015 MarketWatch study, nearly 40% of current employees said they aspire to own their own business sometime in the future. If you’re one of those employees, you can build your business while remaining an employee. You can work 9-5 and then come back home to work from 5-9. In the beginning, you’ll have to say no to your social life, and instead, stay home to steadily work towards fulfilling your dreams. But you’ll quickly find that it’s all worth it. Although it seems that everyone is starting an Internet business these days, keep in mind that there are many different ways to do business online. What really matters is the “why” you want to pursue an online business in the first place. An Internet business doesn’t need an office, staff, phone, desks, or copiers. It only needs a website and something to sell. This removes many of the barriers of entry that prevent people from starting a business. In the beginning, why not keep it simple? You can consider the different options of operating as your business grows, but this is one big benefit to launching your idea now. Once your business is up and running with systems in place, your business is manageable wherever there is Internet access. The benefit of operating from anywhere is you no longer have to sacrifice family time. You could easily be at your child’s soccer game, and still be engaged with the business. Starting something online is an obvious choice for many wanna-be entrepreneurs because of the low initial financial investment. There are a variety of businesses that you can start for less than $100. Some can even be started with no investment other than your time. Starting your own business takes motivation and dedication, but if you commit to doing it, your opportunity for success is automatically greater than someone who just continues to dream. For about 8 years now I have supported and helped where I can, my beautiful wife Chrissy, with our home business, BestEverHomeBusiness. We are independent home business owners under the umbrella of a global privately owned company, now a leader in the Personal Development industry. Doing this around my full time job meant I was up early, put on some online ads, sent links to Chrissy and basically did whatever I could to make her day easier, and then off to work. Our decision for me to give up full time work and step up to work alongside Chrissy with our Home Business, is turning out to be the best business decision we have ever made. I still get up early to put facebook leads into our lead manager, listen to training calls either live or recorded, do my daily personal development and now, phone people in Canada and the US, (we’re in Australia) and do the things that are written in my DMO (daily method of operation). My website GetofftheTools.info was born to give those who are needing a change away from their mundane physically hard workshop environment. I now work alongside my best friend Chrissy, and with the expert simple guidance from Shane and Rachel Krider. Our momentum is building and growing dramatically. We work consistently but not hard from home, and take the necessary breaks whenever we want to. We are a great team and have an efficient ever evolving system. BestEverHomeBusiness has been going and growing strong since 2008 and growing naturally. Our blogs, social media presence, and just sleeves up perseverance, consistency and determination has proven to be our strong point. Just never give up. If you give up you lose. 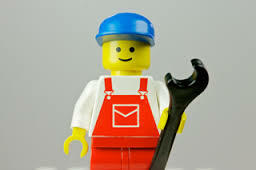 We follow the simple system and don’t try to reinvent the wheel. Doing the simple thing well and being consistent is all we have to do. I am so proud to be alongside my best friend working well together. Go to my other blogs with various other topics and subscribe as to not miss out on my ravings and shared ravings…. My thanks also go to my good friends, Rachel and Shane Krider for being instrumental in me travelling this yellow brick road. Recently we just enjoyed a road trip from Tamworth to The Gold Coast so we could drop my mum off at a resort for a 4 week holiday. My BestEverHomeBusiness didn’t miss a beat because I could sit beside the pool and speak to people around the world that are looking for what we offer… A portable and profitable business that allows us to enjoy a lifestyle. When I made the decision 7 years ago to move forward with this business model, I could not even send an email so looking back I’m not sure how I thought I could create success in an online business. ( lucky I don’t over think things) I remember sitting in front of my computer some days in tears feeling really overwhelmed and thinking what am I doing. Like any journey it starts with the first step and over the last 7 years I have just taken lots of steps forwards always moving towards my goals. What that meant was following our simple system, our training and being a product of our Personal Development products. What comes to mind is….. It may not have been easy but it sure is worth it. 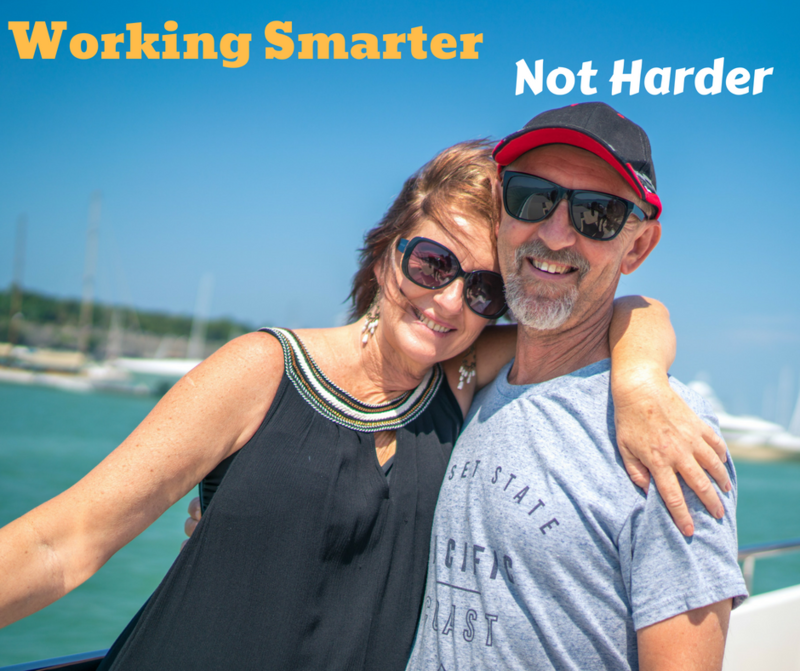 Col (best husband ever) has joined me in our BestEverHomeBusiness recently with his marketing niche, ‘GetOffTheTools‘, means we can travel anytime or anywhere we want with no time constrictions. However we do absolutely love being home on our 400 acre lifestyle block with our…. 7 horses, 9 dogs, 2 cats, 8 Pigeons ,1 ferret , 23 chickens, 8 goats, 3 turkeys, 2 geese and a 54 year old turtle called Sam…. (oh and my Mum who is 85 going on 50.). Our Son and his family also have a home on the property so they are available to look after the animals when we decide it is time for some travel. NOW as the ‘Happy Baby Boomers‘ this is the exact reason why we saw massive potential with BestEverHomeBusiness, and unmatched ROI, for Time and Money FREEDOM. Would you like to start your journey with me, and help me guide you to your created future? It is easier than you think because this is exactly what you need to do … Think. Go to my other blogs with various other topics and subscribe as to not miss out on my ravings….. Emotionally intelligent people constantly look for ways to add value and contribute to their environment. They use their emotional awareness to think progressively and find answers to problems. This quality helps them to inspire others to be successful, too. According to Steve Jobs, “Creativity is just connecting things. When you ask creative people how they did something, they feel a little guilty because they didn’t really do it; they just saw something. It seemed obvious to them after a while. According to Henry Ford, “Nothing is particularly hard if you divide it into small pieces1.” Successful people apply the domino effect toward their ambitions by making small and continuous improvements every day. In the end, it takes consistent practice to be successful. Success doesn’t happen by accident, but because you have committed yourself to certain activities, that will help you reach your goals.